Light, fluffy and guilt free, this Pineapple Pistachio Marshmallow Dessert is both fun and delicious! 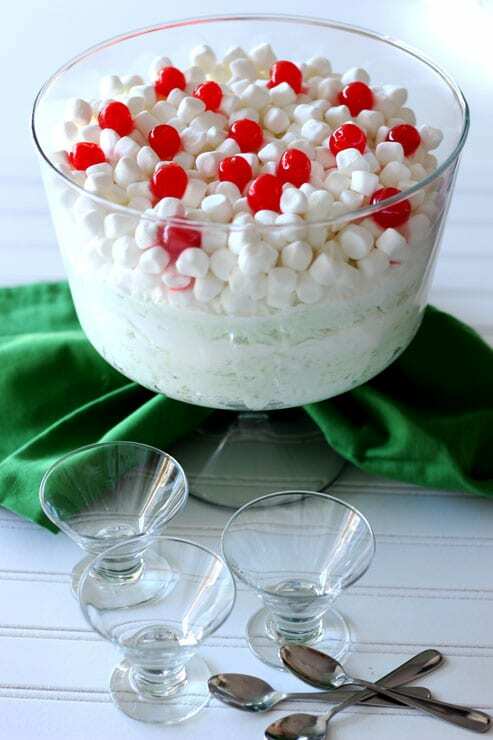 Pistachio pudding, pineapple and walnuts layered with Cool Whip and miniature marshmallows makes for the best layered dessert! 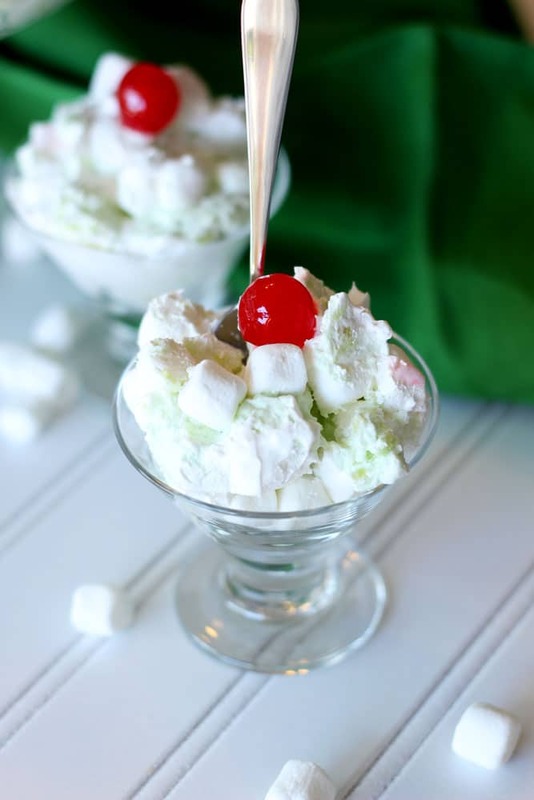 We have 2 holidays coming up and this Pineapple Pistachio Marshmallow Dessert is perfect for both St. Patrick’s Day and Easter! Vastly different holidays, I know. But with St. Patrick’s Day coming up on March 17th , you need something GREEN!! Easter falls on April 1 this year and you know that with the warm weather coming around you are going to need a cool and light sweet treat to serve at your Easter dinner! And bonus time…you ready? It’s SUPER fast to make! No hassle, no bake, no mess! It’s what I like to call my “healthy dessert”! Sweetness! Yes, it’s dessert time! Like I said, I consider this Pineapple Pistachio Marshmallow Dessert to be more along the lines of a “healthy dessert” and man….does this one taste AMAZING! And it’s so pretty! Since it’s so pretty and fast to make, not only do I serve this for St. Patrick’s Day and Easter, but I take this one to picnics and neighborhood get togethers. I always get amazing comments on how appetizing this dessert looks and tastes! 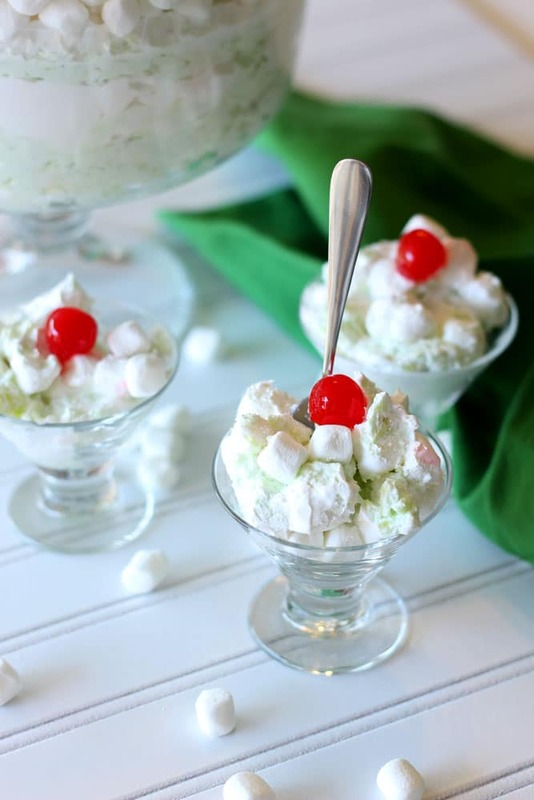 Have you heard of a Watergate Salad? 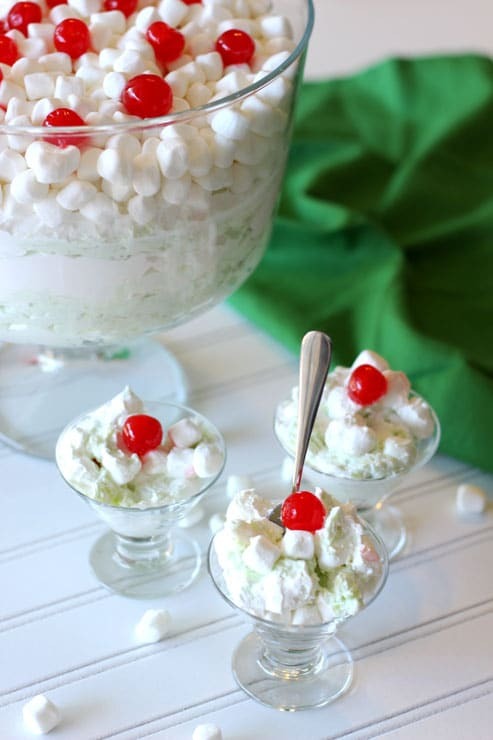 That’s what this dessert is often referred to…the Watergate Salad. If you’re from the south like I am, you’ll remember this dessert at church potlucks and family get togethers along with casseroles like my Cheesy Macaroni Tuna Casserole and Brenda Rowland’s Chicken and Rice Casserole. I remember my mom making this dessert for me as a little girl. But she didn’t call it Watergate Salad. She called it Pineapple Pistachio Marshmallow Dessert. And doesn’t that sound amazing?! And look at it…it looks as amazing as it sounds!! My mom shared this recipe with me years ago and with the weather being so nice here in Arizona, I decided to make this yesterday to surprise the kiddos after they got home from school. What an amazing snack!! This Pineapple Pistachio Marshmallow Dessert has such a light taste. The pineapple and pistachio mixed with the whip cream is an amazing combination! 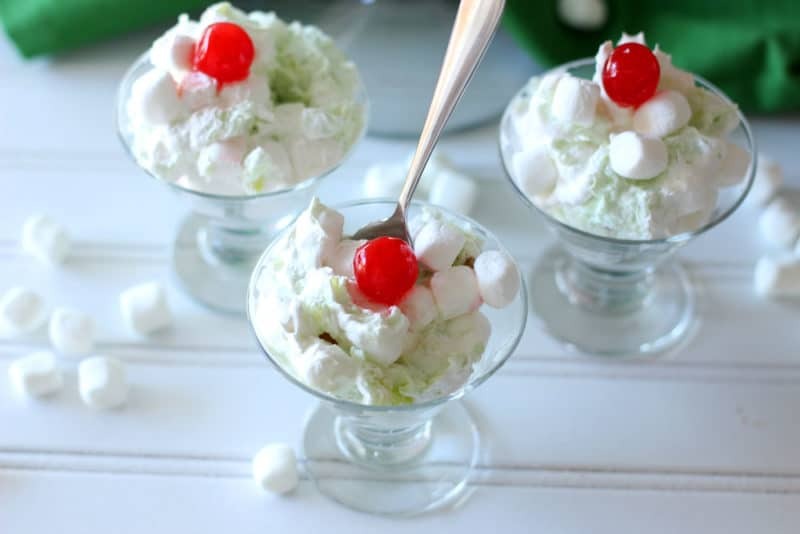 The light mint green color is the perfect pastel color for Easter and spring and the Cool Whip makes this one light and fluffy. Ya’ll, it literally took me 10 minutes to put together. Super fast and easy to make. This dessert is Gluten Free and high in vitamin C! I promise – you will NOT feel guilty after eating this one! Share the love with this sweet treat and Happy St. Patrick’s Day, Happy Easter and Happy Springtime Eats with this one! Stir the dry pudding mix, pineapple with juice, walnuts and 1 cup of the marshmallows in a large bowl until well blended. Gently stir in 1 tub of the whipped topping. Empty the remaining tub of whipped topping into separate medium bowl. Add 2 cups of the marshmallows; mix lightly. Spoon half of the pudding mixture into large serving bowl; cover with another layer of half of the marshmallow mixture. Repeat both layers. Top with remaining 1-1/4 cups marshmallows and the cherries. Refrigerate at least 1 hour before serving. Store leftover dessert in the fridge. Love this Pineapple Pistachio Marshmallow Dessert recipe and want to share it? You know you do! Share a couple of different versions! Pin THIS pin to your favorite EASTER board on PINTEREST! Pin THIS pin to your favorite St. Patrick’s Day or Holiday board on PINTEREST! For everyday sharing, pin THIS dessert to your favorite DESSERT or SWEETS board on PINTEREST! This is one of my all time favorite desserts. I even have a version on my blog. It always amazes me how every family, or region, has their own version of this recipe. Your version seems like it would be fluffier than mine because you have more cool whip than I use. I think I will try that next time to see if my family likes it better your way. I haven’t had this salad since I was a kid! How fun to see it again! I’m forwarding your url to my niece, she’s always looking for colorful delicious desserts to make with her kids. They are going to love this! Thanks for forwarding the recipe!! I hope they love it! I love desserts and this one is going to be on my list! so refreshing. Yes it is! So refreshing! You know, I’ve heard the term Watergate SAalad, and was never quite sure what it was – thanks for enlightening me! I do agree that it’s more a dessert than a salad… and very pretty ! 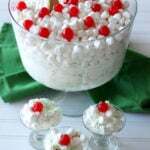 I’ve never heard of Watergate Salad, but then I’m a borderlands girl. Lol. It’s pretty hard to beat 10 minutes for a pretty holiday dessert! Yeah this one is a southern classic! A fun treat to enjoy for the spring holidays! 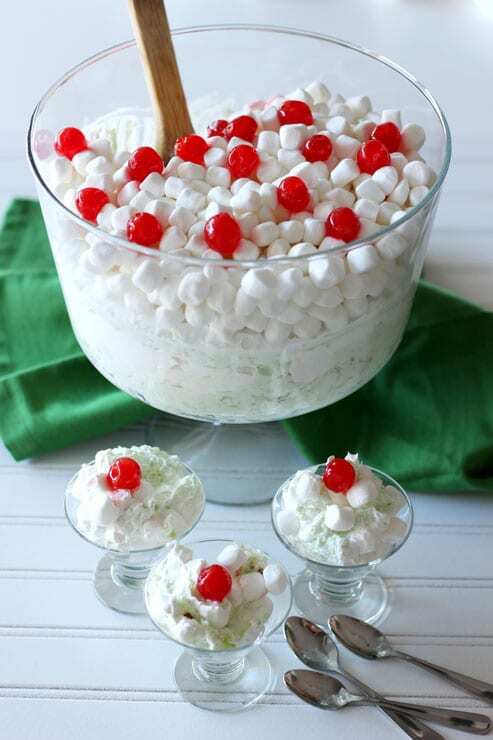 Wow, the Watergate salad takes me way back. I remember most of our family picnics at that time included it. I don’t remember adding marshmallows, though. What a nice addition to a classic salad, which is more of a dessert. I guess if you call it a salad you don’t have to feel guilty. True and good point! Glad I brought back some memories on this one! My grandma used to make something like this, only she didn’t put any cherries in it. I love the pop of color that they add! This is a total comfort food dish for me – I haven’t had it in yeeeeears, and now I’m craving it big time! You should make it, for sure!! This dessert is so perfect for anyone with a major sweet tooth. And I’m all about pistachio flavours, so this wins for sure. Oh my, it looks so decadent! I love pistachios and marshmallows but it has never occurred to me to combine these two. Awesome idea! Thanks! I hope you enjoy this sweet treat!